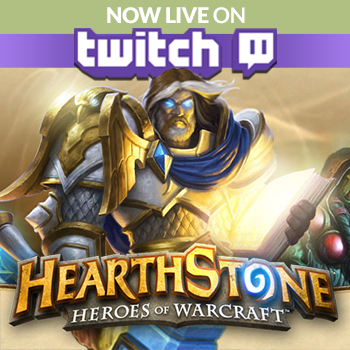 Join The Escapist Live for Hearthstone Arena! Whether you're an Arena veteran or still new to the nuances of Hearthstone, you might learn something from our Arena stream at 3pm eastern! If you missed our introductory Hearthstone stream on Wednesday, you can check it out right here to catch up. It's recommended for those of you who aren't already familiar with how Hearthstone works, so you'll have a better idea of what's going on when we stream Arena at 3pm today! If you're not familiar with Arena, it's basically the Draft format in Hearthstone, where you are presented with three cards at a time, of which you choose one to add to your deck. Once you've constructed your 30-card deck, you'll face off against other players and their own concoction. It's got a lot of randomness to the format, but it's hugely entertaining all the same. Starting at 3pm eastern time, and running until we hit three losses (as are the rules of Arena,) we'll be streaming everything from the draft to the matches, with colorful commentary from Janelle Bonanno and myself along the way. Catch up on Wednesday's stream, or hop into chat and check us out at 3pm today right here!